Kasper & Payne provides a full range of legal services to individuals, small businesses and municipalities. Its areas of practice include business formation, estate planning: wills & administration, loan closings & real estate, traffic & criminal litigation, uncontested divorces, and civil and criminal litigation. 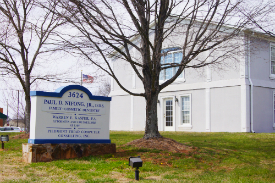 The Kasper Law Firm opened in Clemmons, about 10 miles from Winston-Salem, N.C., in 1980. Since then, the firm’s attorneys have provided individualized service and counsel to businesses, residents and family members of residents of Forsyth, Davie, Yadkin, Davidson, Guilford and other nearby counties, as well as visitors to the area who need representation. The firm expanded in 2013, and began practicing as Kasper & Payne, P.A. Kasper & Payne, P.A. also serves as retained counsel for the Village of Clemmons. Thank you for your interest in our firm, and please contact us if we can be of service to you, your family or your business. © 2019 Kasper & Payne, P.A.